If you fish, you probably remember your first encounter with a smallmouth bass. The memory of the fury at the other end of the line never completely fades. Although they are not as sought after as largemouth bass, or four species of trout in New Jersey, their relative scarcity makes them prize-worthy. Actually, they are not all that hard to find, especially in the northern tier of the state. Most New Jersey anglers know that smallmouth bass inhabit the region's large lakes, such as Hopatcong, Greenwood, Swartswood, Split Rock Reservoir, and Merrill Creek Reservoir. And smallmouths are particularly abundant in the Delaware River, where a six pound, four ounce fish held the state record for many years. What many don't consider is that many small rivers or streams, seasonally stocked with trout, also support year-round resident populations of smallmouth bass. The Paulinskill, Wallkill, Pequest, Musconetcong, and others are all destinations for smallmouth fishers. Most of these streams are also home to a smaller population of the smallmouth's cousin, the largemouth. Although they grow bigger, largemouth bass are lesser in punch and wrestling strength. In the summer of 2010, a six-pound, nine-ounce pound smallmouth sucked in an angler's crayfish in the Raritan River South Branch, still shy of the state record, a seven-pound, two-ounce lunker caught in Round Valley Reservoir in 1990. Stream smallmouths over five pounds are very rare, and bass in the two to three-and-a-half pound range are about as common as are holes six feet deep or more. A good hole will often hold two or three of this size, and long, slow stretches with mere three foot depths will hold a good fish, and many smaller. Although smallmouths frequent today's clear water, rock based streams in New Jersey, they are not native here. They are wild as can be, but smallmouths hail from the Midwest, from Pennsylvania's Allegheny Mountains, and the St. Lawrence River and Great Lakes System, westward to reaches of the Mississippi River Basin, and as far north as Hudson Bay Basin. First discovered by settlers in the eighteenth century, a few eager anglers connected with Erie Canal boats began to bring smallmouths into New York State as early as 1825. By the mid-nineteenth century, new populations spread east and west by rail. 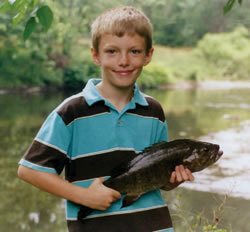 The author's son has learned the pleasures of the smallmouth. I caught my first smallmouth bass when I was thirteen—perhaps half a dozen seven-inchers—on popping bugs using a fly rod at the tail end of September, intending to catch large sunfish in Stony Brook, Princeton Township. I didn't know they were there, but quickly found that I could wade the stream a full mile or more and encounter no one, catching bass in every stretch and riffle. When the trout hatchery crowds dissipate by about the first week in June, smallmouths are fully active and available. Action can be had all summer with a variety of lures. Smallmouths readily strike throughout the day, so if you want to be most certain to find summer solitude, fish them on a hot, sunny afternoon and cool yourself by wading in shorts and sneakers far between bridges. Not that sunrise or sunset is a bad time to fish. An after-work jaunt to a good hole might yield the fish of a lifetime. The trick may be to get there just at sunset, because the first cast is most important. Around sunset, the lunker's usual wariness transforms into an aggressive pose, and very often the largest bass in the hole will respond to that initial cast. As late as November a good catch can be made on split shot weighted live shiners. And even in winter, so long as the streams aren't frozen over, it's possible to catch a bass or two on weighted live shiners, or by specialist techniques such as letting a tube jig sit on the bottom of a deep hole a minute at a time, its plastic tentacles subtly moved by slow current. Big fish eat more than small ones, and it may seem like a conundrum that the largest smallmouths remain aloof in the middle of the day, while the little guys hit readily. Most anglers assume that bass stay in a stretch or hole for extended periods, but I've learned, by some fairly persistent snorkeling with my son on the North Branch, as well as by my own and another's anecdotal evidence, that smallmouths move around. Apparently they travel at night; I've never seen such shifting of places during the day. This leads one to wonder if these big, noble bass do most of their feeding at night, if not during the magic hours of sunrise and sunset. But the first and last hours of the day are better times to try; wading boulder-strewn streams seems a bit risky. Another consideration is the size of lure or bait. I believe the big bass try to take large meals for economy's sake. The more they can eat at once, the less energy they need to expend. Bring a bucket of large shiners or killiefish. Size matters much more than quantity, and you won't need more than half a dozen. Or a fat, juicy chubb is dynamite, so long as it isn't too large. Cast into the deepest water. Use no weight—often the lunker will blast the bait on the surface. No snaps or swivels are needed, only a size six, plain-shank hook on four pound test for good sport. Set the hook a few seconds after the strike. An ultralight rod and reel is put to the test; no other freshwater fish fights so hard. The difficultly is the fight itself, especially if tree roots or other cover is nearby. Otherwise, it's so easy that releasing these special fish makes sense. By recognizing size and any marks on a lunker's body, it's possible to name it and see it, or even catch it, time and again, possibly in different places on a given stream. I've known of a twenty-one inch smallmouth sighted in a hole on the North Branch to have been caught later in a stretch upstream in the Lamington River, above the confluence of the two streams. 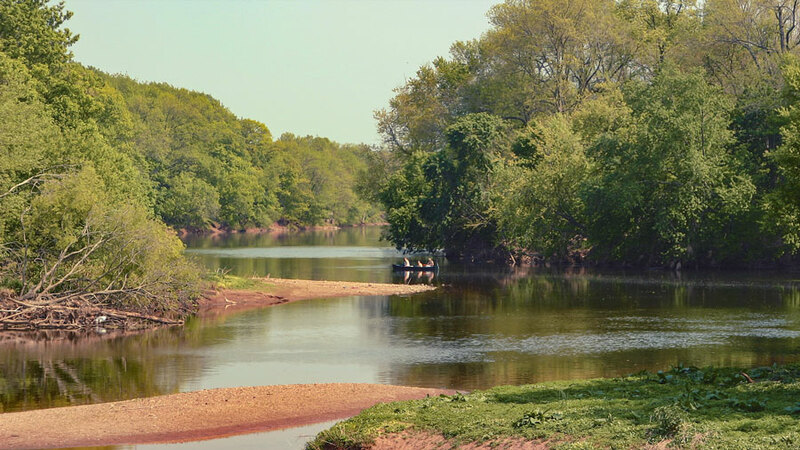 An inviting stretch of the Raritan River, near the confluence of the North and South Branch. Unless you become a specialist at staking out lunker holes, average sized fish of nine to thirteen inches are great fun to catch. There is a wide range of lures, from all variety of plastics, whether threaded on jigs or plain shank hooks, to minnow imitation plugs, crankbaits, surface plugs, in-line spinners, small spinnerbaits, spoons, as well as flies such as popping bugs, streamers, crayfish imitations and other wet flies, even nymphs. Years ago on Stony Brook I used to pedal my ten speed eight miles from Lawrence to wade at least a mile of stream, casting only a yellow, three inch Mister Twister plastic grub placed just right for it to ride straight on a number two plain shank hook. And if I wasn't releasing the dozens of smallmouths I caught, you would say I was after blood, because every number counted to me. I would ride home, then write the exact number I had caught in my fishing log. At the end of the year, I would add up and compare figures to previous years, an activity which certainly had a sporting element. But although I still keep the same log, I no longer have any of the mania for numbers I had then. I more appreciate subtle, contemplative differences of all kinds, including differences in approach with lures. Certainly the ways that smallmouths can be caught are as limitless as imagination, whether by which lures and techniques, or which attitudes and values. More important than lures is reading water. The most general rule is that bass relate to the deepest water. So while fishing any given stretch or riffle, look for the shadowy depths. While wading upstream, spooked smaller bass will often shoot out of a headwater riffle, racing for deeper water, home base. But especially if a riffle has two feet or more of water, and some rocks with space underneath, be ready for action. Smallmouths hide away all day during summer in fast moving water, metabolizing oxygen, and you'll probably not see them. If a smallmouth can fin under a rock in fast moving water, it will. Otherwise, it will position behind something that breaks the current, receiving plenty of life giving oxygen. Cast these areas even if you see no bass. Once and awhile you may catch a very black bass—a smallmouth that has remained under a rock out of the light, and kept a dark coloration as a result. A bass will ambush food that rolls or swims by such a rock that it can see outside, in the light. For the most part, the smaller bass feed throughout the day on tidbits during the summer, such as insects and small crayfish, particularly molting crayfish. Fly fishing is a subtle and productive approach, but the fish are not averse to try and swallow five-inch, fat Senco plastics in the middle of a blazing summer day. It's not hard to find a good spot. Just about every stretch on these streams contains at least a couple bass. But a couple bass should not concern much time fishing for them. Move on and try the next stretch, riffle, or hole. More important than reading water is timing, and part of timing is positioning. Stand as far back from the casting target as possible, so as not to spook fish. After a couple casts, move closer for better accuracy. There are advantages to those fat Sencos—they cast a mile, and bass pounce on them like cats. For heavier lures such as these, a fast action rod of medium power is perfect. Four or six pound test is fine. And such a rod should handle lighter lures well, too. Small minnow imitation plugs work best in fast water. And for those deep, fast water runs, small, diving crankbaits bounced off boulders and dug into gravel take savage hits. In-line spinners, and eighth ounce spinner baits work especially well in fast runs, too. A spinner bait can be retrieved fairly quickly at a variety of angles and cover area faster than soft plastics, which are more effective in slow water. Whatever the lure well used, smallmouths will savage it. Both the smallmouth and largemouth are known as black basses, members of the sunfish family, which also includes the crappies and bluegills commonly found in our ponds, lakes and streams. Females are generally larger than males, who build nests into which they induce a partner to deposit eggs. After he fertilizes them, the dad continues to guard the nest until the eggs hatch and the fry leave the nest. Smallmouths live up to fourteen years, not as long as their dominant cousins which average sixteen years.